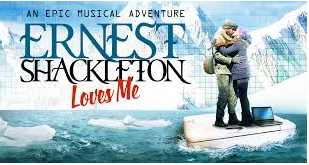 “Ernest Shackleton Loves Me” Wonderful New Musical Off-Bway! 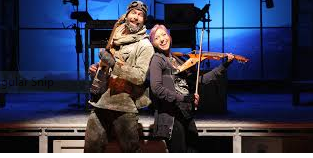 “Ernest Shackleton Loves Me” is the most wildly inventive musical of the Off-Bway season. And if anyone would have told me I’d be raining superlatives over a two-person love story that’s set simultaneously in Brooklyn and Antartica (!) I wouldn’t’ve believed them! But it’s true! It’s all true! 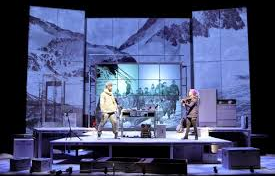 And 19th Century Arctic Explorer Ernest Shackleton has come back to life(Through a date searching app on the Internet) to make wild, theatrical magic love to a single 45-year-old Mom with a baby named Zach in an unheated apartment “far out” in Brooklyn, well, it just sounds preposterous. But the theater exists to make the unbelievable, believable.And “Ernest Shackleton” amazingly does just that .Our heroineKat (the extraordinary singer/actress/musician Val Vigoda) is an experimental music composer, whose living room is filled with every kind of electronic musical device imaginable, including a red, heart-shaped electric violin, which she barely puts down and a set of amplified drums that she beats all her many frustrations out on. This assemblage of electronica is backed by a gigantic computer screen, behind the stage, on which we see her many, many wild fantasies play out on. The frigidity of her (very) cold water flat and the stress of her life as an artist. 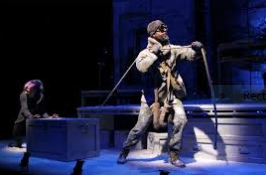 “I gave my life to art!” she plaintively sings, sends her over the edge and into the imaginary arms of studly Arctic hero, Ernest Shackleton, who calls out to her romantically through the Internet dating site, “Katherine! Katherine!..”and then enters her own version of Antarctica, through (where else?) her refrigerator. Wade McCollum and Val Vigoda are the star-crossed lovers linked by the heroic struggles both are going through. He, to reach his high-flown Arctic goals, and she, well, just to survive her life. Her baby never stops crying, her computer’s keyboard keeps re-looping the word “Alone,” and they spend “Ernest Shackleton Loves Me” finding each other in the highly unromantic ice and snow, which the dauntless duo here turn into a winter wonderland. The fiery Ms. Vigoda has also written the equally red-hot, heartfelt lyrics to go with Brendan Milburn’s Irish-inflected score. There are a lot of sea shanties mixed in with the hard-rock and the love songs and the rock-solid book is by Joe DiPietro of “Memphis” fame, who really knows his way around a musical. And underground there is massive musical amplification on every kind of instrument imaginable by Sound Designer Rob Kaplowitz and Orchestrators Ryan O’Connell and Glen Milburn. And the super-skillful director Lisa Peterson makes the duo seem like a cast of thousands.